Sidi has well established their name in the world of boots. Specifically, we've seen a lot of success with their adventure touring and off-road options. Many of you have likely overlooked the Charger in lieu of the Crossfire or Adventure Rain. Within the past year, the Agueda now crowds the lineup as well. Choices, choices, how to decide? Lets break it down. Other than the Adventure Rain, all the boots I've mentioned are not waterproof, so they would require a Gore-Tex sock for wet conditions. Their main purpose shines in the arid conditions of desert riding, where rocks and stones may break your bones, but precipitation is rare. 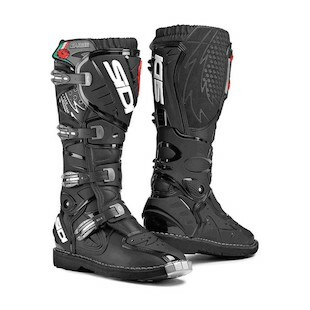 The Sidi Charger Boot could definitely be considered an entry-level competition option, however, keep in mind that the sole is not as easily replaceable without the SRS system found on the Crossfire. On the flip side, the Charger boots are a hefty step up from the Agueda or Trial Zero boots considering the addition of more hard part protection and the aforementioned hinge. Keep in mind that the Charger is about as tall as they come in the boot world. We wouldn't recommend this for casual use or commuting unless you have to cross a desert to get to work. Leave us your comments on the YouTube review above and let us know your experience with the Sidi Charger!